South to the Anna Plains Track. The route south was nominally following a old cut line but that petered out quickly or became overgrown and it was easier for us to make our own way over the sand dunes following the rough direction of the cut line. It was tough and slow going as we had to recce most sand dunes on foot first first to ensure a) that we could get over them and b) that the steeper southern side wasn’t too steep or blocked by vegetation. The southern side was often steeper than the approach side and covered in different foliage. With no previous wheel tracks to follow, we also had to beware of potential soft patches which could have caused a roll over. With only the benefit of ground based topographical assessments, on the 7th we did 21.4km but on the 8th we managed 24.8km. 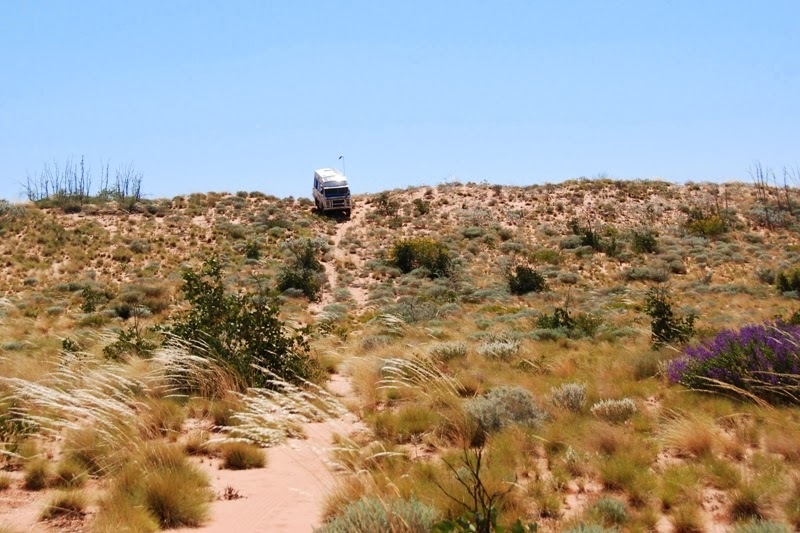 It was very slow going over spinifex clumps and pushing through thickets of small but sharp shrubs. But over the top, the swale between sand dunes had almost park-like qualities with tall, white barked trees in a grassland environment. Hard to believe were in a very remote desert location. 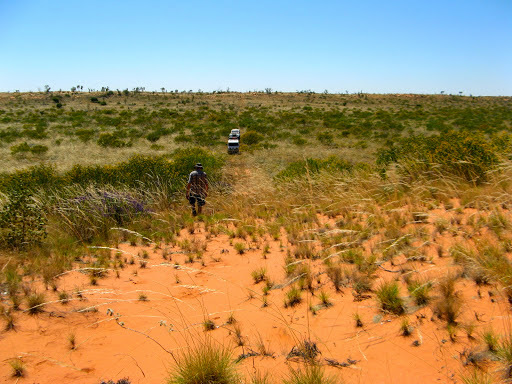 Compared with a swale on the next day which was more desert-like spinifex and small shrubs. It’s as if each swale has it’s own micro climate and plant community. Sometimes we could make out a former exploration cut line which helped with navigation and sometimes made progress a bit easier but mostly they were overgrown after 30 years of non-use. Occasionally we came across survey markers from a bygone age. About that time, an idea was forming in my mind. Seeing the terrain from ground level or even the top of a sand dune can be difficult and deceptive. What we needed was a local form of Google Earth, but in real time and closer to the ground. 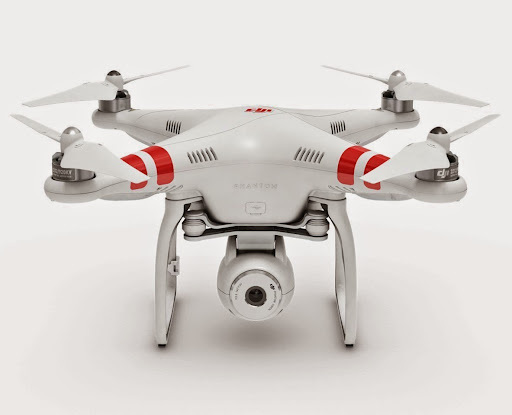 Like a quadcopter drone with a live TV camera fitted underneath and Wi-Fi connection to a display on the ground. Such devices are becoming common place in search and rescue situations and for surveillance requirements. 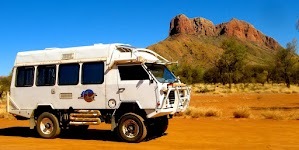 Serious devices are becoming affordable (less than $1000) and for our next outback trip I’ll look into the practicalities of such a system, like this one. 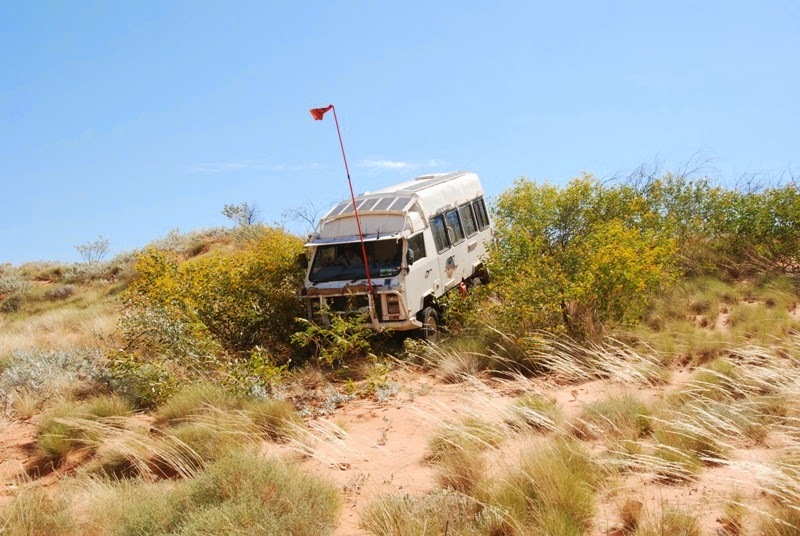 It would have saved us a lot of time and energy by being able to see the lie of the land from within our Okas: assessing potential routes over sand dunes or around thickets of vegetation, and locating potential campsites. 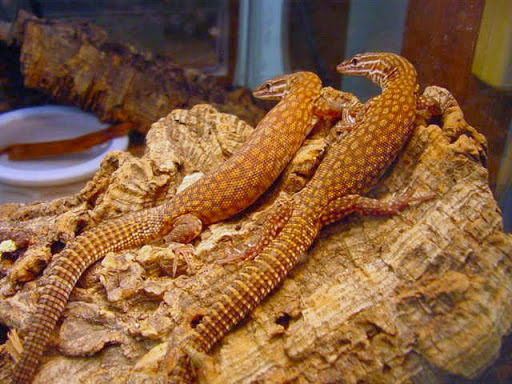 On the morning of the 7th, one member of the group set off on foot, alone and unnoticed, to locate a route over the next sand dune, but he became disoriented which is very easy to do in thick scrub. His distant calls could be heard and he could hear us but couldn’t easily determine the direction of our calls, so the remainder of the team set off towards his calls, keeping in contact but not knowing if he was OK or injured. After 10 minutes of worrisome scrambling though the scrub we located him safe and well, but feeling a bit abashed that he hadn’t taken a hand-held CB with him. It was a salutary lesson for all of us, not to roam too far from the camp alone or without a reliable means of communication. 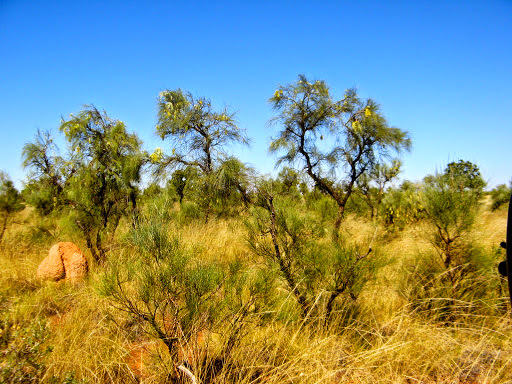 Sharp, hard branches and roots like these were often hidden in the small bushes and spinifex to attract the unwary. The flag on the top of our sand flag subsequently got torn off in heavy going. 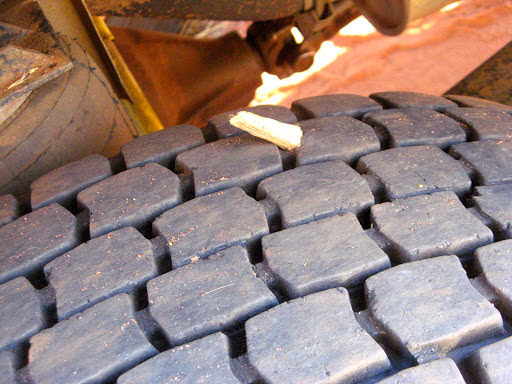 Most of our tyre troubles stemmed from small sharp pencils of dry timber which penetrated the tread of the tyre and went unnoticed until it was flat and running on the rim, destroying the sidewall. Between us we had 5 tyres which were staked and separated from the rims, one of which we found before the sidewall was damaged and could be plugged, but 4 where the sidewalls were destroyed, including one which came off the rim completely. Many smaller stakes were noticed in the treads and removed before they could cause any damage. 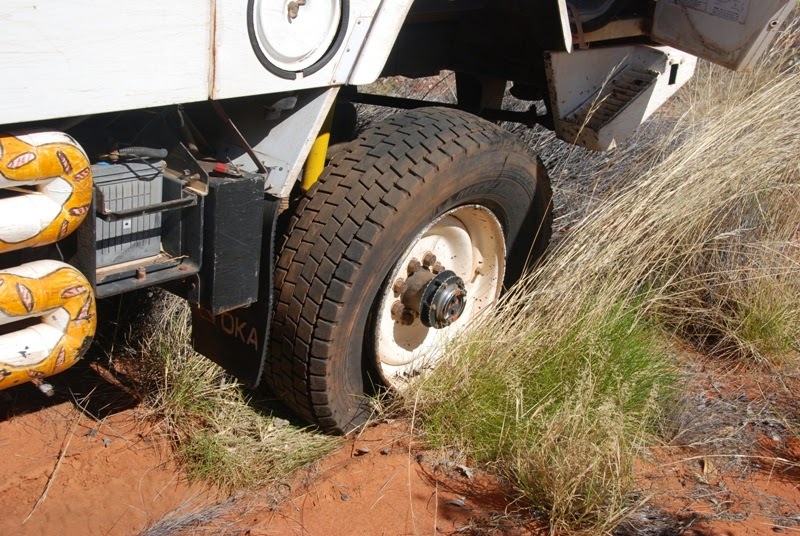 Punctures it would seem, only happen in the most difficult locations, in soft sand, or on spinifex and on the sunny side of the vehicle. It required hot heavy team work to safely lift an Oka in soft sandy conditions to change wheels. 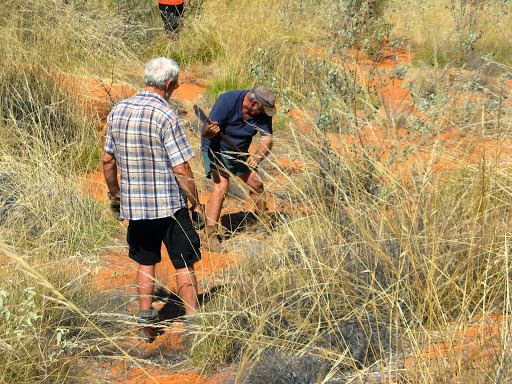 First we had to clear a large area of spinifex and bushes around the wheel before we could start work. Then the jacks would sink into the sand without large base plates, and holes dug under wheels would quickly fill in with dry sand or undermine the jacks. However the benefit of having 3 similar vehicles certainly paid off in terms of experience and equipment, for various jobs we collectively used 2 hydraulic jacks, 2 high lift jacks, 2 hub lifters, axle stands, various jacking blocks and a screw jack. We had one flat tyre which had broken the seal but fortunately it hadn’t come off the wheel and we were able to plug the leak with 2 plugs and reseat the tyre on the rim. 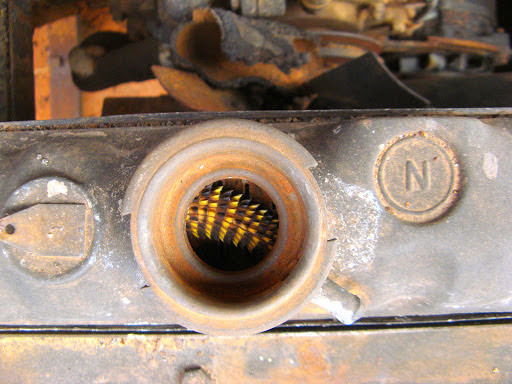 But I still had to replace the wheel subsequently in Broome as the plugs worked loose. Progress had been slower than anticipated and was starting to cause concerns over fuel consumption which dropped to less than 2km per litre at times as we pushed though soft sandy terrain and over around 40 sand dunes in low ratio second gear for most of the day. If things became critical we made tentative plans for one vehicle to proceed with sufficient fuel to make it to Sandfire, and then return with enough fuel for the remaining Okas. 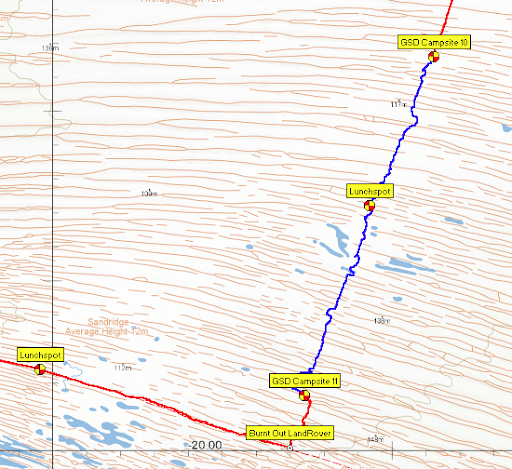 Our route today was nominally on an existing dead straight cut line but you can see from this track plot, our actual track was far from straight as we had to circumnavigate overgrown sections and difficult sand dunes. Shade provided by an Oka for the late afternoon and a campfire for when it cooled down. 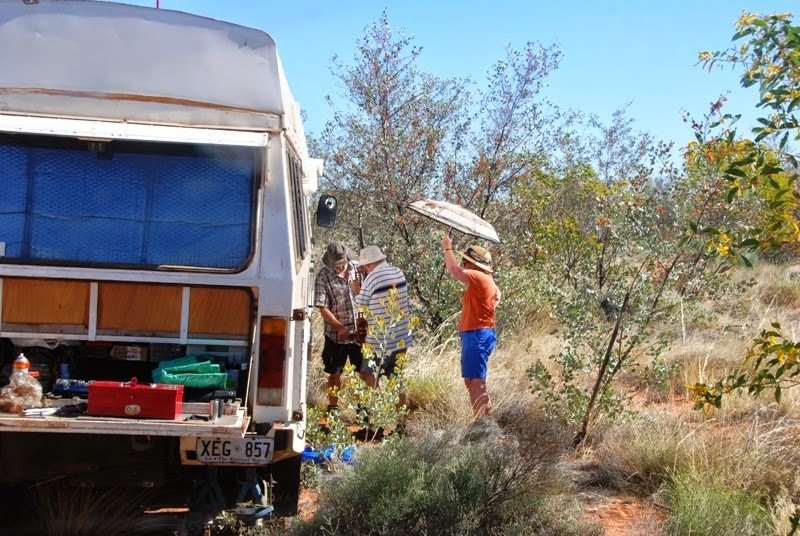 We collected firewood when we could and cleared the spinifex and scrub to make things a bit more comfortable. During the night, clouds rolled in making a spectacular sunrise, but as I pointed out at the time, “they’re only bloody photons”. But they were very attractive photons. 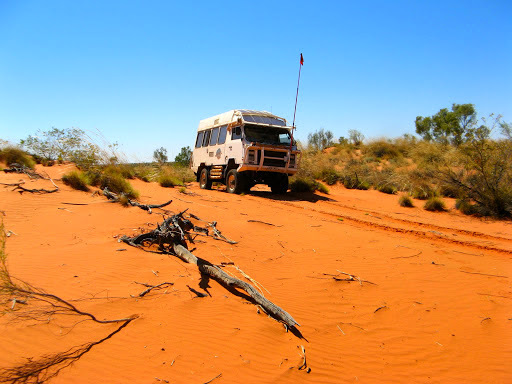 Today, only 4km from our campsite but over around a dozen sand dunes, we completed the southward trek from the Dragon Tree Soak to the Anna Plains Track (APT) after making our own way over 50 or more sand dunes in 3 days. How did we miss something so obvious and anticipated? Well, from our GPS mapping system we knew we were very close to the APT (within 10 metres or so), but we were focused on finding the least difficult route forward rather than looking sideways, and in my defence, some dunes were double or triple headers so a bit of confusion over numbers was not unexpected. Dean and Kaye were following last today and as the rest of us were getting mixed up over the location of the APT, they sat on top of the last sand dune watching the confusion. Then the CB crackled and Dean said he could see an old Land Rover through his binoculars to the right of us, up the track a bit. Well “a bit” turned out to be about 400m but sure enough, near the APT junction were the remains of a old Land Rover and trailer. 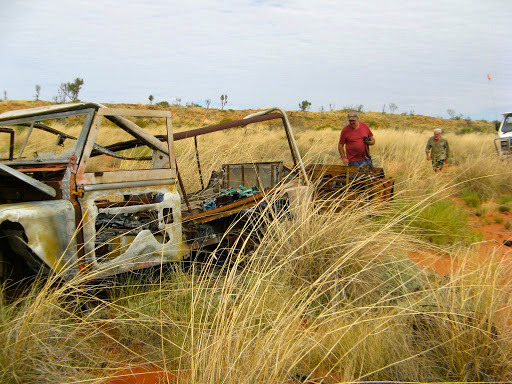 They belonged to a couple of prospectors and were burnt out in a spinifex fire in 2007. Fortunately the occupants recovered their sat phone as they escaped so they were able to call for help and were rescued by helicopter. 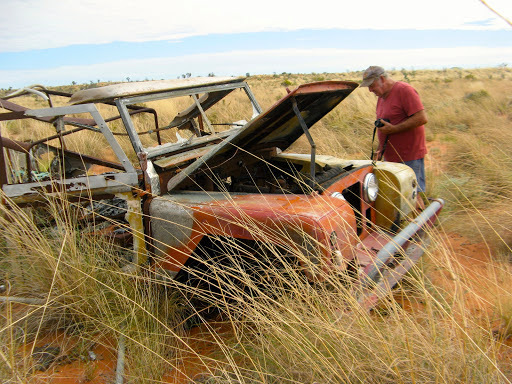 Vehicles broken down or stranded in remote areas normally have no realistic chance of recovery and abandoned vehicles are very quickly stripped of anything useful. 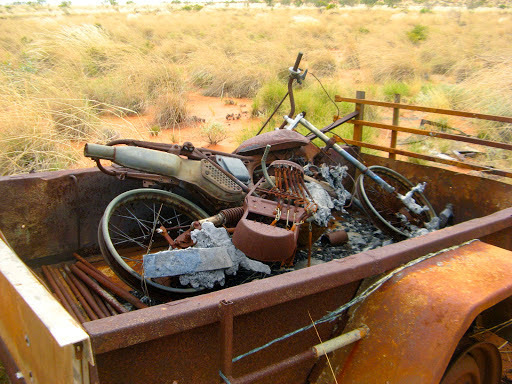 But in this very remote location with no more than a handful of visitors a decade, the vehicle remains are still left pretty much as they were 8 years ago. Sadly, our early optimism from the condition of the Anna Plains Track in this area didn’t last and it was not going to give in easily, it took us another 200km and 3 days of difficult driving to reach the NW Coastal Highway near Sandfire Roadhouse. 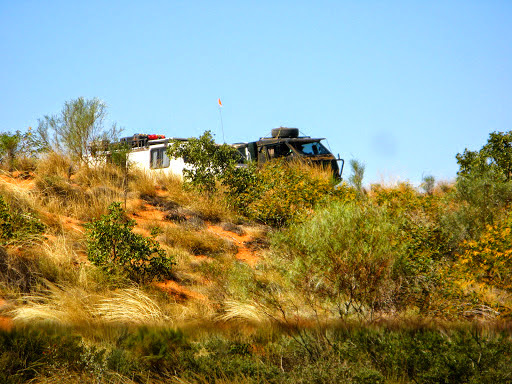 See “Anna Plains Track to Sandfire Roadhouse”.